In a paper published earlier this year, Malcolm Tight explores the theoretical ideas around commonalities in the approaches of communities of practice and Becher’s academic tribes and territories. He conducts a co-citation analysis of Higher Education research journals; focusing on author identities and locations, themes, theories and analyses, methods and methodologies, presenting a rudimentary diagrammatical representation of his analytical modelling. Similar notions of ‘citation mapping’ have been explored elsewhere, particularly in the natural sciences, and a version has recently been introduced to the citation and journal database ISI Web of Science. 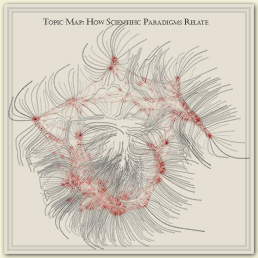 And Interactive Designer W. Bradford Paley’s visualization of 800,000 scientific papers uses author citations to explore the interconnections between science paradigms. Tight, M. (2008). Higher education research as tribe, territory and/or community: a co-citation analysis. Higher Education. 55, 593-605.